It's time for a great social to kick off the summer! NSBE DC is partnering with the Black Code Collective, a group specifically focused on supporting Black software developers and engineers. 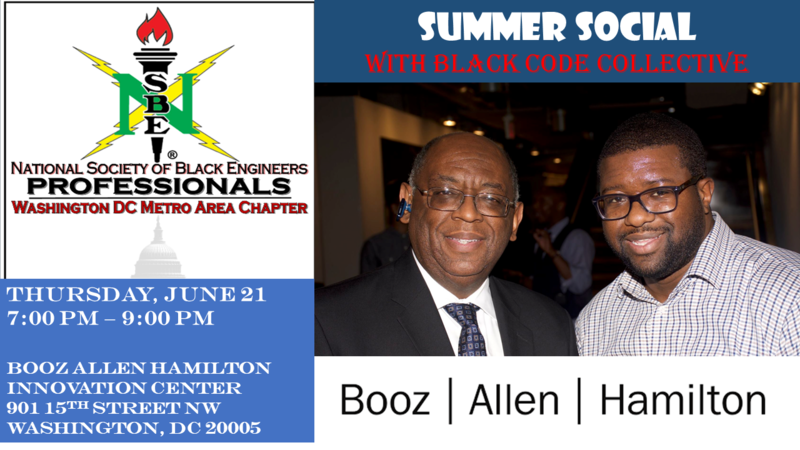 Booz Allen Hamilton will be hosting us again and will be providing food and drink. You will also have the ability to check out the Innovation Center early starting at 630 pm! Check out the Innovation Center at https://www.boozallen.com/about/innovation/washington-dc-innovation-center.html. Please register in order to get an accurate head count for Booz. There is paid street parking, but it will be tight as the Innovation Center is right in the middle of downtown DC. The nearest Metro station is McPherson Square (Blue/Orange/Silver Lines). Metro and Uber/Lyft are highly recommended for transportation.